Pransellknit » Blog Archive » oh where oh where did my will to write go? oh where oh where did my will to write go? There hasn’t been a shortage of things to write about lately, but I’ve struggle to actually get on with writing a blog post. This is mostly due to having to get a pair of socks finished by this weekend, so every time I thought about writing a post, thoughts of not finishing the socks in time were enough to stop me from sitting down and writing. I’m glad I did refrain, because I’m giving these to my Mum today, and I only finished blocking them yesterday. 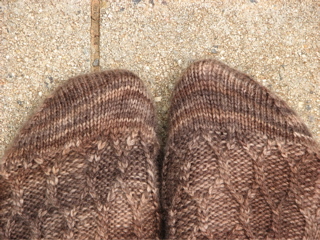 These are the first pair of socks I’ve knit in over a year, and the first pair of patterned socks. 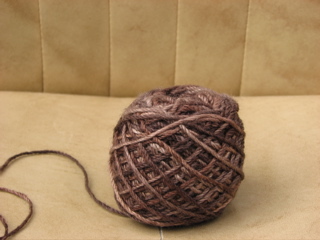 It was also the first time I had to worry if I had enough yarn to finish the job. I needn’t have worried, there is plenty left. The colour pooled a bit, but it looks a lot more severe in photos than in real life. I think the cables draw enough attention away from it to be ok, but to be honest, I just didn’t have time to do anything about it, once I started to notice it on the first sock. If I had more time to modify the pattern, I would have tried to continue the pattern, in some form, down the back of the heel, as I find the transition from the leg to the heel a bit abrupt. Apart from that, I quite enjoyed knitting them. The knittery yarn, as always, was lovely to knit with. I’m not exactly sure what I’m going to knit next, as a few of the projects I have lined up will be unbloggable. I guess I can always try to write about something else instead! I love these socks. And the colour of the yarn! Lovely! the pooling isn’t that noticeable on my screen, so if it’s less in the flesh, mustn’t be too bad? I am yet to find a way to avoid it, other than luck!